This was a shot I took on a recent walk along the sea front. There were lots of children running around and playing but this little girl was just stood watching the sea and the waves. 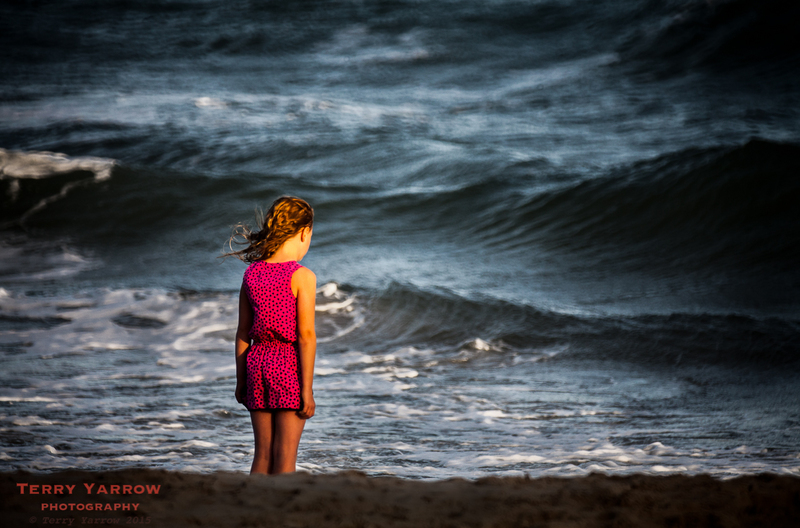 It was late afternoon and warm light from the low sun was striking the girl making her stand out from the darker sea. The contrast between the frail child’s body and the powerful sea just struck me and it seemed like she was just waiting for the sea to swallow her up. I processed the picture to try to bring out this feeling of threat and the inevitable frailty of human life in its physical form. Fortunately of course, the physical life is not all there is…….! A couple of days after I took this picture, the body of a 3 year old boy was washed up on a Hungarian beach as the family tried unsuccessfully to sail across to Europe. This sad event that was reported world wide just seemed to make this picture more poignant so I thought I would share it on my blog. On a technical note, it was taken using a 500mm lens that has the effect of compressing the perspective which adds to the feeling that I was trying to convey. Very striking! I love the lighting and how the bright colors she’s wearing form such a powerful contrast to the darker sea in front of her.